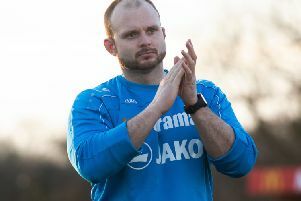 Hemel Hempstead Town manager Dean Brennan is calling on his team to record two victories over the Easter weekend and keep their season alive. The Tudors still have an outside chance of making the Conference South playoffs, but victories over Maidenhead United at home on Saturday and away at Concord Rangers on Monday are essential if they are to stay in the hunt. “Easter weekend defines everybody’s season really – it will either keep our season alive or we will be out of any chance of putting in a successful bid for the playoffs,” said Brennan. Maidenhead are on a dismal patch of form and are winless in eight league games – a run which has seen them slip to 18th place in the table, just six points above the relegation zone. However, Brennan insists his team will not be taking their struggling opponents lightly on Saturday. “When you go into these games, you’ve got to earn the right to win – especially against Maidenhead because they are fighting for their lives,” said the Tudors boss. “We have to make sure that everyone is on their game. “Last week I think that only Dom Hyam and Laurie Walker were on their game and we got beaten by Boreham Wood. That’s how it works at this level, whoever you play. “I’ve looked at Maidenhead’s results over the last month and I think they’ve only lost by one goal in all of their games. Even though they’ve only picked up a couple of league wins since Christmas, they haven’t been getting battered. We want to keep our season alive and we’ve got a cracking opportunity to put things right this weekend. Should they overcome Maidenhead, Brennan knows that Monday’s clash with an in-form Concord side could define Hemel’s season. Concord currently sit one place above Hemel in the table in seventh, just one point adrift of the playoff places. They are four points above the Tudors, and are unbeaten in their last 13 league games. “Over Easter we do look at both games because we will train tomorrow and work on gameplans for both games,” said Brennan. “We will rotate because we always do on the bank holidays – we’ve got the squad to do it. “To be fair to Concord they are a really good side and if you are not on your game against them, you will 100 per cent get beaten. You won’t get away with it against them. Two victories would put Hemel right back on track following Saturday’s defeat at Boreham Wood, and Brennan says the mood is good in the camp. “Five wins would guarantee us a place in the playoffs, but I can’t really predict what anyone else is going to do; it’s all about ourselves,” he said. “The positive thing is that we’ve got everyone available this weekend – last week we had three of our back four out. So we will go into these two games with a positive vibe and I know the players will work their socks off.